I'm a bit confused on some of the results I am seeing from ps and free. My understanding of how Linux manages memory, is that it will store disk usage in RAM, so that each subsequent access is quicker. I believe this is indicated by the "cached" columns. Additionally, various buffers are stored in RAM, indicated in the "buffers" column. So if I understand correctly, the "actual" usage is supposed to be the "used" value of "-/+ buffers/cache", or 561 in this case. So assuming all of that is correct, the part that throws me is the results of ps aux. 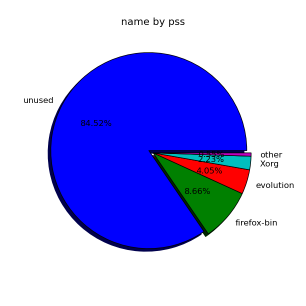 My understanding of the ps results, is that the 6th column (RSS), represents the size in kilobytes the process uses for memory. Shouldn't the result be the "used" column of "-/+ buffers/cache" from free -m? So, how can I properly determine the memory usage of a process in Linux? Apparently my logic is flawed. The linux virtual memory system isn't quite so simple. You can't just add up all the RSS fields and get the value reported used by free. There are many reasons for this, but I'll hit a couple of the biggest ones. Because large portions of physical memory are typically shared among multiple applications, the standard measure of memory usage known as resident set size (RSS) will significantly overestimate memory usage. PSS instead measures each application's "fair share" of each shared area to give a realistic measure. So PSS is the interesting column here because it takes shared memory into account. Unlike RSS it's meaningful to add it up. We get 654Mb total for userland processes here. Overall about half of memory is used for cache (494Mb). Bonus question: what is userland cache vs kernel cache here ? For more information about it see the man page man pmap and also have a look at 20 Linux System Monitoring Tools Every SysAdmin Should Know, which list great tools I always use to get information about my Linux box. Between these 3 you should have pretty accurate results. You can also use more detailed replacements for top I recommend htop or atop. Edit: Almost forgot if you want really detailed information. Find the PID and cat the following file. -has a section Chapter 5: Performance Tools: Process-Specific Memory -it has way more information than you would ever want. ps gives you the amount of memory used by each process. Some of that memory is mmapped files, which counts under cache. Some of that memory (especially code) is shared with other processes, so if you add up the RSS values it's counted multiple times. There's no right answer to “how much memory does this process use?”, because it doesn't depend on the process alone, it also depends on the environment. There are many different values you might call the “memory usage” of the process, and they don't match or add up because they're counting different things. As others have correctly pointed out, it's hard to get a handle on actual memory used by a process, what with shared regions, and mmap'ed files and whatnot. If you're an experimenter, you can run valgrind and massif. This may get a bit heavy for the casual user but you'll get an idea of an application's memory behavior over time. If an application malloc()'s exactly what it needs then this will give you a good representation of the real dynamic memory usage of a process. But this experiment can be "poisoned". Run this on a machine with less than 16GB of RAM and, voila!, you just scored 16GB of memory! (no, not really). And massif says "sum of all allocs() = 16GB". So that's not very interesting. And here we see (very empirically and with very high confidence) that the compiler allocated 77KB of heap. Why try so hard to get just heap usage? Because all of the shared objects and text sections that a process uses (in this example, the compiler) are not terribly interesting. They're constant overhead for a process. In fact, subsequent invocations of the process almost come for "free". MMAP() a 1GB file. Your VMSize will be 1+GB. But you're Resident Set Size will only be the portions of the file that you caused to be paged in (by dereferencing a pointer to that region). And if you "read" the whole file then, by the time you get to the end, the kernel may have already paged out the beginnings (this is easy to do because the kernel knows exactly how/where to replace those pages if dereferenced again). In either case, neither VMSize nor RSS are a good indicator of your memory "usage". You haven't actually malloc()'ed anything. By contrast, Malloc() and touch LOTS of memory -- until your memory gets swapped to disk. So your allocated memory now exceeds your RSS. Here, your VMSize might start to tell you something (your process owns more memory than what actually resides in your RAM). But it's still difficult to differentiate between VM that is shared pages and VM that is swapped data. This is where valgrind/massif gets interesting. It shows you what you've intentionally allocated (regardless of the state of your pages). It ll show you how much memory user by users..
total_mem="$(echo $m + $total_mem | bc)"
Use this command to find memory utilization in %. Shouldn't there be more RAM free than this? Why total RES doesn't match used memory in top command?